Livermore Nuclear Weapons Lab’s 200 Executioners Ready 1-30-7 « Bob Nichols Said WHAT About Your Radiation This Week !?! Livermore Nuclear Weapons Lab’s 200 Executioners Ready — WHEN!?! SAN FRANCISCO — About 200 Executioners will report for work one day soon at the Lawrence Livermore Nuclear Weapons “Lab” in Livermore, California and methodically, even “professionally,” set about executing the premeditated random murder of hundreds of innocent victims in the San Francisco Bay Area. The Bay Area is home to About Seven Million potential murder victims, all blissfully unaware of the deadly radioactive uranium gas about to be released in a “dirty bomb” by the 200 Executioners. Gay or straight, bisexual or transgender, black or white or Asian, it makes no difference to the cold blooded murderers at Livermore as the employees mindlessly carry out their proscribed “tests” and “detonations.” After all, the money’s good, why would they ever ask anything? THE WEAPON. The weapon of choice in this long running random killing spree is a radioactive metal aerosol so small, tiny even, so finely divided, that it acts like a gas. Weaponized insoluble ceramic uranium oxide and uranium nitride gas or aerosols have only two purposes. Those are to 1) kill people, and 2) contaminate the land. The uranium metal then catches on fire and burns at more than 3000 degrees. The fumes are radioactive gas [aerosols] deadly to all life forms. Dr. Chris Busby found them in giant high volume air filters in England from Iraq nine days after the United States started bombing Iraq in the “Shock and Awe” bombing campaign starting on March 21, 2003. England is 2500 miles away from Baghdad. The San Francisco Bay Area is just a few miles away from Livermore’s radioactive bomb detonation site. California’s fantastically rich agricultural valleys are just a few miles inland. It is time to recognize the reality of the situation. San Francisco is under attack from the Nuclear Weapons Lab at Livermore, California. THE LOCATION. The deadly explosive “device” will be detonated at the Livermore Site 300 Open Air 7000 acre detonation site one mile from Tracy, California. The facility is run by the nearby Lawrence Livermore Nuclear Weapons “Lab.” The Nuke Bomb Factory is “managed” for the Federal Government by UC-B and has been, continuously, for 61 years. HISTORY. A variety of Executioners working for the Nuclear Weapons “Lab,” UC-B, and the Federal Government, since 1961, purposefully detonated thousands of pounds of deadly weaponized uranium gas. The Executioners are responsible for poisoning and contaminating thousands of people, buildings and land in the San Francisco Bay Area. The British Intelligence Agency called MI-6 has used the casualty rate figure of 10,000 people killed and maimed per ton of weaponized uranium gas explosively aerosolized and released. Supposing, for example, the Executioners explode 1000 pounds a year for 46 years. That works out to a kill and maimed casualty figure of 230,000 persons – men, women, and children. The Lawrence Livermore Nuclear Weapons “Lab” recently “requested” that the maximum amount of uranium exploded annually be increased to 8000 pounds by the San Joaquin County Pollution Control Board. In other words, the Masters of the Nuclear Weapons Lab decided to increase the annual premeditated random casualty rate by 35,000 men, women and children. However, all the radiation dose rates are calculated for male victims between 15 and 34 years of age, generally, the strongest and healthiest human specimens. This lucky group of men’s chances of getting a radioactive, chemically poisonous, heavy metal particle are, simply stated, about 5 chances out of a thousand all things being equal. However, things are not equal or fair; women, children and older men suffer higher rates of radiation related death and disease. A large daily newspaper and Livermore apologist, The San Francisco Chronicle, really distinguished themselves by blaming the high rate of breast cancer in nearby Marin County in the 1990s on hot tubs and smoking cigarettes. At the time Marin County had the highest breast cancer rate in the world. The Lawrence Livermore Nuclear Weapons Lab, now called Livermore National Laboratory, apparently regards the Seven Million human beings in the San Francisco Bay Area as just so many expendable lab rats. 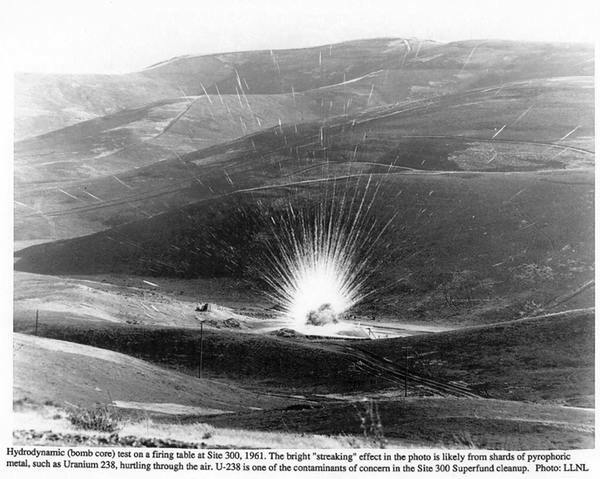 The picture of a uranium bomb explosion at the Livermore Site 300 caption reads “Hydrodynamic (bomb core) test on a firing table at Site 300, 1961. The bright “streaking” effect in the photo is likely from shards of pyrophoric metal, such as Uranium 238, hurtling through the air. U-238 is one of the contaminants of concern in the Site 300 Superfund cleanup. Photo: LLNL.” LLNL is the commonly used shorthand name for Lawrence Livermore National Lab. HOW URANIUM KILLS AND MAIMS. Weaponized uranium metal bombs detonated with high explosives create tiny aerosols of burning uranium oxides and uranium nitrides. The uranium burns at more than 3000 Degrees. The fumes created contain the tiny ceramicized particles that are so devastating to human bodies and all living things. The ceramicized uranium gas is toxic in at least three ways. The radioactive toxicity is well known. A milligram of uranium oxide is smaller than the period at the end of this sentence. For the rest of our eternity that same milligram fires of 1,251,000 little bullets a day. That’s One Million, Two Hundred and Fifty Onr Thousand. Then you, individually, have the power of an H-Bomb for your own personal internal ionizing radiation source that decimates those cells around it. Cancer, anyone? The chemical or heavy metal toxicity is well known and applies equally to uranium. The catalytic toxicity of ceramic uranium compound aerosols is perhaps the most dangerous and least well known. It wrecks the information flows in the body. Uranium is always attracted to phosphate structures and since DNA, RNA, and Mitochondrial DNA are phosphate structures, genetic mutations are introduced that never go away. Whether you or your loved ones in the San Francisco Bay Area get sick and die of cancer, cardiovascular diseases, nueromuscular diseases, renal (kidney) disorders, endocrine disorders or some combination of these dreaded diseases; they all can be set off by the radioactive uranium gas Livermore’s Executioners are set to send to the San Francisco Bay Area. There are two public agency meeting coming up Febuary 6th and 7th. This is where to go to have your traditional California say in whether or not this travesty continues. The City of Tracy City Council Meeting and the San Joquin Air Pollution Control District.. You all know what you should do. Bob Nichols is a Project Censored Award winner. He is a newspaper correspondent and a frequent contributor to various online publications. Nichols is completing a book based on 15 years of nuclear radiation war in Central Asia. He is a former employee of the McAlester Army Ammunition Plant. Nichols can be reached by email, and readers are encouraged to write to him at: DUweapons@gmail.com Mr Nichols states “I am indebted the following individuals for sharing their knowledge and understanding of ionizing radiation which made this article possible. Dr Doug Rokke, US Army, Ret., Leuren Moret, Dr Chris Busby, Dennis Kyne, Karen Parker, JD., the US Army, Department of Defense and publications from the Lawrence Livermore Nuclear Weapons Lab with numerous authors. 1) Donate monies to be used to fight large explosions at Site 300 at Livermore National Lab. Funding to hire experts is desperately needed. Donate by check or online. Put: Site 300 Explosions on Memo line. If you donate online, also be sure to send a note to marylia@earthlink.net telling Tri-Valley CAREs that you would like your donation to be used to oppose Site 300 explosions. Email correspondence addressed to or carbon copied to City Council is a public record. 3) Attend Hearing to show support on Wednesday, February 7 at 10 a.m. THIS ARTICLE ALSO APPEARED, PER GOOGLE SEARCH OF 6 24 2017, HERE AND THERE…. Jan 10, 2008 – But first let’s discuss the UC scientists who like to play with nuke …. Livermore Nuclear Weapons Lab’s 200 Executioners Ready – Bob Nichols.